One of the principal aims of Constructing Scientific Communities is to discover nineteenth-century models for twenty-first century citizen science projects, in which large numbers of people from various walks of life gather and analyse data under the direction of research scientists. 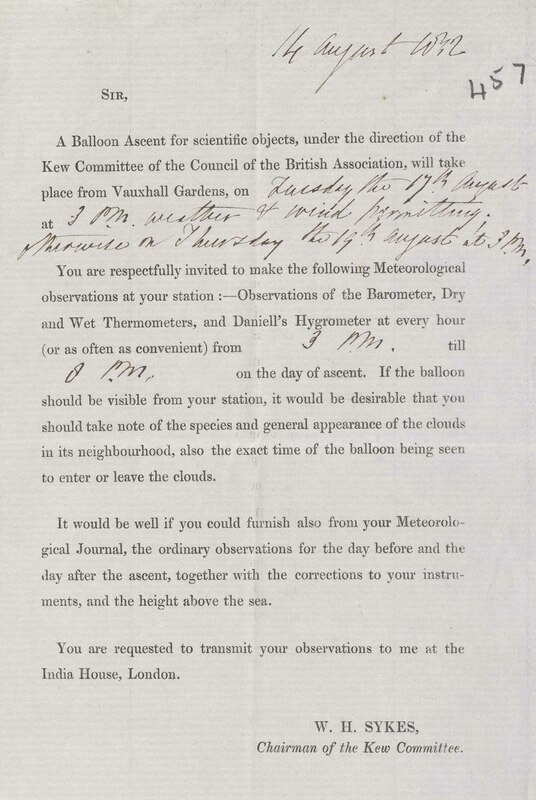 A hitherto little-known example of nineteenth-century citizen science dates from 1852, when some private individuals, in addition to a handful of astronomers working in observatories, were invited to make regular observations of the weather during a series of four daredevil balloon ascents between August and November 1852. The first serious scientific balloon flights in Britain, they were organised by the ‘Kew Committee’, a committee of the British Association for the Advancement of Science, which then ran Kew Observatory near London. Formerly the private astronomical observatory of King George III, Kew Observatory had been taken over by the BAAS in 1842 and it quickly became a powerhouse of innovative meteorological experiments, observations and instruments. It would soon become world famous as a centre for geomagnetic research, solar astronomy and instrument testing, as well as meteorology. Reporting to the Kew Committee was the Scottish physicist John Welsh, superintendent of Kew Observatory from 1852 to 1859. Welsh personally went up on all four balloon flights and was in charge of the scientific observations. On the first two flights, he was accompanied by Richard Nicklin, an assistant observer at Kew. All the ascents were made in the large Nassau balloon that was owned and operated by Charles Green, the leading British balloon pilot, or ‘aeronaut’ of the time. Each flight was launched from Vauxhall Gardens, a well-known London pleasure resort for the well-to-do. The principal scientific goal of these balloon flights was to measure the temperature and humidity of the air at different altitudes. As late as 1852, the properties of the upper atmosphere and the circulation of weather systems around the globe were poorly understood. Nor was there as yet any national weather service or system of professional weather stations as we have today. In order to obtain reliable comparisons with weather data on the ground, it was necessary to employ a large network of volunteer observers underneath where the balloon would be flying. The unpredictable winds at altitude meant that the path of the balloon could not be predicted in advance. For example, the first flight, launched on 17 August, ended near Swavesey in Cambridgeshire, yet on the last ascent (10 November), the balloon nearly landed in the English Channel, eventually coming to rest near Folkestone. The volunteer observers were therefore scattered across a large area, to ensure that at least a few of them would be in the vicinity of the balloon’s flight path. The majority of the observers were in a wide range of locations across southern and eastern England, including Aylesbury, Bedfordshire, Norwich, the Isle of Wight, Oxford and Cambridge, as well as the London area. Results were also used from observers even further afield, in places such as Edinburgh and Belfast, likely so that a picture of the weather across the whole of Britain on the days of the ascents could be built up. Example of a printed circular with instructions to volunteers taking weather observations on the ground during the balloon ascent of 17 August 1852. Reproduced by kind permission of the Syndics of Cambridge University Library, MS.RGO.6.402.457. Prior to each flight, the Kew Committee sent out a circular, asking the observers to take readings of the barometer, hygrometer, and dry and wet thermometers every hour while the balloon was in the air. The circulars also requested the volunteers to note the types of cloud in the vicinity of the balloon (if the balloon was visible from their observing station), and to send in their regular weather observations for the days before and after each ascent. Ever committed to scientific precision, the Kew Committee even asked volunteers to send in the corrections they made to their instruments and their station’s height above the sea. The example illustrated here is the circular sent to the Astronomer Royal, George Airy, three days before the 17 August flight. It is not known how the volunteers came to take part in this project, but it is likely that members of the Kew Committee wrote to a large number of people whom they knew to be active meteorological observers and invited them to contribute. Of the thirty-four observers who participated, six might today be described as ‘professional astronomers’. These included George Airy at Greenwich Observatory and Manuel Johnson of the Radcliffe Observatory in Oxford. Yet almost none of the rest did science for a living: they were mostly private gentlemen, a fair number of them clergymen with scientific interests. At least some of the data produced by the observers were used in analysing the results of the ascents. Welsh’s paper describes how in order to compare the temperature of the air at different altitudes, it was necessary to measure the temperature on the ground along the track of the balloon. This was achieved by selecting and averaging the results from observers closest to the course of the balloon on each flight. The ground observers’ results were essential in demonstrating the drop in temperature with altitude. On 17 August, the balloon reached a maximum height of 19,000 feet, where a temperature of 10° Fahrenheit (-12°C) was recorded, while the mean temperature on the ground was 71° Fahrenheit (21°C). It could be argued that the ground observations were mostly made by privileged individuals with time and money to do science. But the principle of using volunteer observers in support of a large scientific project was exactly the same in 1852 as that used in today’s citizen science projects such as those managed by Zooniverse. James Glaisher (1809-1903). Source: Wikimedia Commons. One of the ground observers was James Glaisher, head of the Magnetic and Meteorological Department at Greenwich. Welsh’s ascents in 1852 inspired Glaisher to carry out a series of even more daring meteorological balloon flights in the 1860s, which brought him national fame. Unfortunately, Welsh himself died in 1859, aged just thirty-four, which might be one reason why his pioneering work in 1852 – plus that of his airborne companions and the volunteer observers on the ground – is not so well remembered today. Yet the balloon experiments of 1852 paved the way for later studies of the upper atmosphere, in addition to acting as an inspiring exemplar of a research project in which private citizens provided much of the large body of supporting data required.